Why Does my Bird Need a Parrot Playgym? Home | Why Does my Bird Need a Parrot Playgym? Imagine staying in the same room every day, all day, never having the chance to leave. Your food and water is brought to you daily but you can never leave that room. That is the life of a feathered companion who does not have time out of his home (cage). 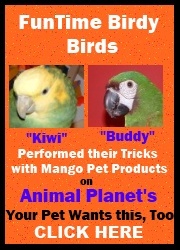 Leaving a bird in a cage 24 hours a day 7 days a week can lead to a lot of emotional problems for your feathered friend. For example; feather plucking, screaming and ultimately being afraid to leave the cage at all to name a few. Birds need time out of their cage as a daily routine. With schedules being so busy these days people tend to come home, make dinner and go about their nightly activities until bed time leaving no time to interact with your bird. This is why having a parrot playgym is so important, you are able to let your bird come right out of his cage when you get home and he/she gets to stay out until bedtime. A parrot playgym should be a place for your feathered friend to play and have fun while still being a part of your family. He can enjoy dinner with you while sitting on his playgym. He can then sit and watch you go through your nightly routines including watching TV with you all while being on his playgym. Independent play on the play gym or play stand should be encouraged much the same way that one encourages a baby to play independently in their play pen. Basically, your bird is no different. Being part of the family and knowing that everyone is around while being able to entertain him or herself is essential to the growth and well being of your feathered baby. There are many different styles and price ranges to consider when choosing a parrot playgym or bird stand for your feathered friend. Make sure that the playgym has bird toys or a place to have bird toys on it. This is very important. You do not want to invest money on a playgym that your bird is bored on. Make sure to find a parrot playgym that is sized appropriately for you feathered friend. Most importantly, your feathered friends playgym should not be taller than you. In other words, when you stand up next to the playgym your bird should not be towering over you. If your bird is sitting on their playgym and he or she is towering over you, this will cause dominance in your bird and present other problems. Having a parrot playgym for your bird not only will keep him/her healthy and happy but will also allow him/her to be an active part of your family.